American Goldfinch are really on the move, along with expected migrations of Blue Jays and Flickers etc. 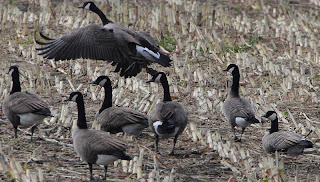 Common Ravens do some dispersal/migration this time of year. Next 4-5 days have lots of north winds forecasted! Friday through Sunday could be the large push of Turkey Vulture migration in Ontario, which is also a great time to look for Swainson's Hawk.. I don't think I'll have a chance to look, but you could! Head to Seacliff near Point Pelee!!! - Arctic gull migration has started as well. 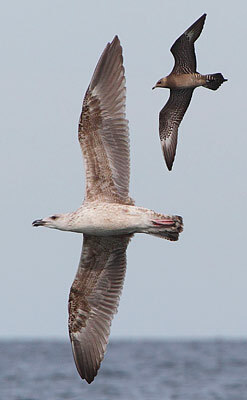 I had my first "Northern" Juvenile Herring Gull at Port Burwell on the weekend. It's not too early for Thayer's Gull! Anyone think this style of blog is better than the old? Worse? Anyone want to leave a comment below? Curve-billed Thrasher in Manitoba... Would be new for Ontario.. Thunder Cape anyone? Black-backed Woodpecker in Ohio... (A.Wormington)- apparently they're on the move early in Northern ON, along with Boreal Chickadee... Could this be the movement year we've all been waiting for? pics of the CACG's to come in the future. A juicy low pressure system laden with tropical moisture is heading towards Eastern Ontario from the southeastern states. 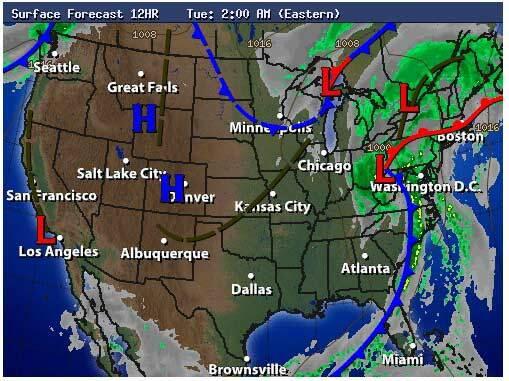 It will bring a large shield of rain and perhaps even a thunderstorm or two tonight and Tuesday. Current indications suggest a general rainfall of 40 to 50 mm across the district before rain tapers off to scattered showers by Tuesday evening. Higher amounts of 50 to 60 mm are quite possible in a few locales which receive persistent heavier rain bands or a thunderstorm. Strange storm coming from a strange location (SE States)... Could blow something southern in, but could also ground high arctic migrants (White-rump Sands, Plovers, Godwits, Jaegers). Another thing to remember is, there is a large number of disorientated Terns and Skimmers on the east coast from the NS Hurricane. The winds on the coast aren't horribly strong, but could it be enough to get one of these "lost" birds inland? Maybe? Your odds of finding a Skimmer in ON have gone from 0.3% to 3.3%.. That's a 1000% increase! 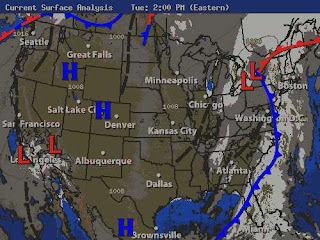 But even then, the centre of low pressure is forecast to pass right over the Hamilton area. All air blows into the centre of the low, possibly bringing a rarity from any direction! Something to keep an eye out for, at the very least. Maybe a good few days to check your local spot, just in case. Low pressure for everyone! yay! Well I found out today that google listed my site as dangerous, thanks to my on-going problems... Woo! I think I know how to fix it, but it might take a few days. Since I didn't get out birding today.. I decided to do a year-tally of the pelagics I've seen this year (Since it seems to be a huge year)... I've missed the last 2 "boat weather" days, but will hopefully get out for the next ones! And those are the ultra-conservative counts. For future trips, I'm expecting to hit the bulk of the Parasitic Jaegers. Kittiwakes should be on their way, and Pomarine's will hopefully be some of the most cooperative boat-birds. Arctic Tern and Red Phalarope are the target species. I actually think Red Phalarope will be quite easy - just need a "calm as glass" day. - who says LTJA's never chase other birds. On our way back to the convention dinner, we stopped at the big creek marsh were we turned up most of the expected puddle ducks (Pintail, Wigeon, BW & GW Teal, Gadwall, Wood Duck, A. Black, Shoveller, etc..
14 Sandhill Cranes, 4 Common Moorhen (Family) and 2 Long-billed Dowitchers rounded out the birds here before it was off to dinner! Vortex spotting scope (Razor) also worked out great. Vortex has let me borrow the scope in hopes of showing it around, and informing people about how incredible the quality is for the price. The angled eyepiece, and rotating collar worked PERFECTLY for getting everyone to see the birds without adjusting the tripod. Excellent stuff! 1. Tip of Point Pelee in the morning.. Can be great for waterbird flights, and passerines flying overhead. 2. Beached birds - Shorebirds, Gulls, Terns etc. will be sitting on beaches (Port Burwell!! !, Port Stanley) today thanks to huge waves. Great way to find a fall Laughing or Franklin's Gull. 3. Lakewatch from Fifty Point CA in Grimsby: birds feeding near shore thanks to upwelling (if you can find the feeding groups). Better in late season for loons, gannets, etc. 4. Niagara River - Again, it might be a bit early, but these winds push numbers of gulls into the river. The mouth at Fort Erie could be darn good. 5. Peregrine migration at hawk cliff: could be the first small push of Peregrines riding the cliff edge today. Probably still 5-7 days early though. OFO convention this weekend! I'll be at Port Burwell tomorrow morning to co-lead a hike with Ken Burrell. I'll also have my fancy spotting scope with me (Vortex Razor), so please feel free to ask to take a look at (and through) it! - Long-tailed Jaegers everywhere! Photos from the zodiac. --- Yellow-nosed Albatross in Ontario. We all missed it, but I missed it more. --- Lots of sewage lagoon reports, but nothing too rare! - the rarity everyone did see this period! Gyrfalcon at Point Pelee - April 1st - during a heatwave! National Geographic Book Publication - I managed to get some low-paid images in! 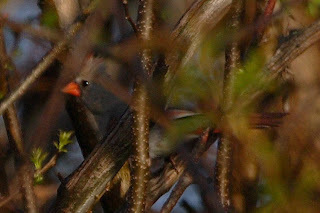 Possible "Vagrant" Cardinal at Point Pelee... and more! - what is this thing.. Why is it so gray, and red.. Welcome to the new blog format. Let's hope this one works!